We’ve been plagued by household crises, from plumbing to septic to water-logged carpet to the theft of sentimental objects and photos. It’s been a challenging couple of weeks, especially as it’s coupled with demanding volunteer work that is taking precedence over my writing, and the start of our new school year. Having to bail gray water from our bathtub and wash all our dishes in plastic tubs has made doing much of our to do list monumental. When two minute showers take an additional twenty minutes of work, when dishes go from a quick chore to one that takes over an hour, we’re left with little time to ensure we’re going out enough, playing enough, and touching base with all areas of education. It doesn’t mean we’re not trying, though. Despite the unpleasantness, we still sat down with Daughter to create an overview of the themes and topics she’s most interested in learning. We’ve also begun summer courses outside the house. For the dual birthdays in our house, I purchased both Daughter Dragon and my partner ballroom dance lessons. Daughter is taking youth lessons that occur soon after her martial arts, and both academies are within walking distance from one another. She can even take a bus home after (but not to her classes, thanks to cuts in bus service for our area). My partner and I are taking couples lessons at a studio in the same area, and finding a bit of awkward joy in one another. Little Fox is taking a break from gymnastics, but only because summer classes are early mornings only, and he doesn’t get up most mornings until after class has started! We’ll return in the Fall for more tumble time, but meanwhile, we’ve been visiting the pool again, both to swim and to use facilities currently inoperable at home. He’s also really into vehicles with wheels (buses and planes are favorites), bubbles, and his new Ponyo toy brought back from Japan by my step-mother who was born and raised in Kyoto-shi. Amidst the chaos that our house has become, we’re slowly becoming more organized. Cleaning out the den helped immensely, and it seems to have cleared our heads a bit to allow us to focus on what’s important. Civics/History: Goal is exploration of WWII, which she understand requires some background in German, Japanese, and American history, including WWI. In the next post, I’ll go over ways we integrate these topics of focus into our days. Little Fox picked out a nifty book on fractals at the library: Mysterious Patterns: Finding Fractals in Nature by Sarah C. Campbell. 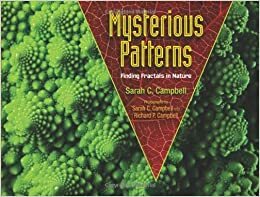 Not only does it show a variety of fractals found in both nature and architecture/landscaping, it explains the patterns and a bit about the history of mathematics that help explain fractals. The book also differentiates between the shapes easily named in the past (e.g. cone, sphere, etc.) and fractal shapes. I’ve been distracted from The Heart is a Lonely Hunter, but will return to it soon. Daughter is now reading Neil Gaiman’s Anansi Boys now that I’ve completed it. For Little Fox, I checked out several books of Anansi stories to read to him. With all the problems with our septic, we’re not cooking much. 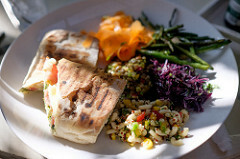 Our diet the last two weeks has been mostly sandwiches, salads, PCC hot foods, and Vietnamese or Mexican take out. And since we thought everything was fixed on Thursday, I went shopping on Sunday with the impression I’d be cooking again this week. So, most of our home-cooked meals are ones involving foods that can be baked on parchment paper on a cookie sheet in the oven. No recipes, but to give examples, we’ve toasted tuna melts in the toaster oven, baked potatoes and sweet potatoes to eat as sides and whole meals with hearty condiments, we had a sandwich bar on Sunday evening with kale, purslane, and arugula Caesar salad, and mixed berry smoothies. Tonight we’re having roasted chicken thighs in garlic and lemon with broiled cauliflower. I might risk making a cheese sauce, and thus having another pot to wash, but it’s worth it. Right?